October marks the 15th anniversary of the debut of The Walking Dead by writer Robert Kirkman and artists Tony Moore and Charlie Adlard. To commemorate the occasion, Image Comics and Skybound Entertainment are releasing a deluxe edition box set comprised of the first three compendiums collecting the first 144 issues of the genre-defining survival horror comic book series, complete with exclusive new covers. In addition to the main comic series, the box set also includes an exclusive expanded edition of the Here Comes Negan graphic novel that revealed the origin story of the iconic series antagonist of the same name. The expanded edition will also include the previously untold origins of Michonne, Tyrese, the Governor, and Morgan. Totaling over 3,300 pages, this is the most complete collection of the apocalyptic zombie horror comic and a must-have for ultimate The Walking Dead fans. The debut issue of The Walking Dead by Kirkman and Moore was released on October 2003 and went on to become a full-fledged multimedia phenomenon. The survival horror series has led to two different television adaptations watched by millions around the world in addition to other The Walking Dead content, including video games, novels and action figures. Charlie Adlard began as the series artist with the seventh issue and continues to produce bestselling new issues of the series with Kirkman every month. The Walking Dead 15th Anniversary Box Set retails f0r $200 and will be released in comic shops on October 3 and in bookstores on October 9. 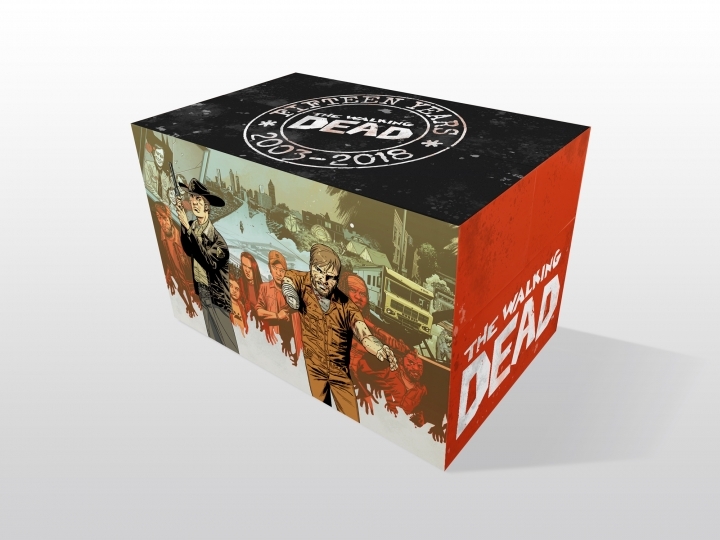 The post Walking Dead Comics Plans 15th Anniversary Box Set appeared first on CBR.